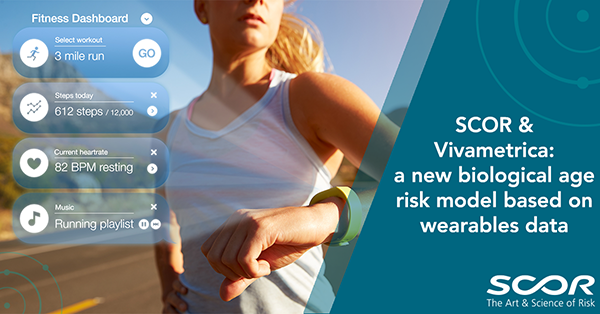 Embracing the insurance opportunities offered by digital technology, SCOR Global Life partners with Vivametrica to develop a new risk model based on data from wearable devices. As technology evolves, reliable data from wearable devices should streamline and accelerate life insurance underwriting, with multiple benefits for customers. In this regard, SCOR Global Life and Vivametrica, a Canadian Insuretech company specializing in health analytics, have signed a partnership agreement to co-develop an exclusive Mortality and Critical Illness risk model designed to assess the “biological age” of individuals, based on the continuous data provided by their wearable devices. This initiative seeks ultimately to increase the number of life insurance products offering discounts, wellness platforms and other benefits to customers whose biological age is lower than their actual age, through a continuous underwriting approach based on real-time data and recurrent touchpoints. Continuous underwriting also minimizes risk, facilitates competitive pricing, speeds up the purchase cycle and improves the bottom line for clients. With leading insurance companies starting to use this approach, the trend looks set to grow.